The highlight of the weekend was Azealia Banks Instagram “war of words” with Rihanna’s Tweets over Donald Trump’s immigration policy, and his move to block certain problematic nations from entering the U.S.A for ninety days. Of course, we have never had a chance to follow Azealia Banks on Twitter, since she’s banned and we sporadically followed and unfollowed her on Facebook, depending on her mood, over the past few months. We have noticed one thing that Azealia likes to do and that is to sacrifice chickens in her free time, inside her apartment, which really ties in with her image of being a “witch” or “dark sorcerer”, of sorts. Seeing her cupboard full of chicken feathers was slightly off-putting, a while back. We especially tapped into her Facebook page after the Russell Crowe incident in October last year, when RZA brought her to an after party in Beverley Hills, read here. It did not take long for Azealia Banks to respond, a quite vocal Donald Trump supporter from day one, weighed in on Rihanna’s Tweet, saying, “Stop Chastising The President”. This is where things began heating up and Rihanna wasn’t sure what to reply with, so she went with the usual, very liberal response of changing the subject, tweeting this photo below, referencing “Chickens”, possibly in reference to Azealia’s “Chicken” sacrifices or to her even being a “Chicken head” in Rihanna’s view or opinion, who knows? This prompted Rihanna to phone up Beyonce, apparently, as this was now going into the dark realm of “black magic” and “sorcery”, so who better to call for that “Backup” than Beyonce? A real “satanist” because of Jay-Z and his “do what thou wilt” Aleister Crowley obsession, and then you see the pattern of “Satanists” in the music industry and it’s usually all really-really bad music. Let’s not forget that Azealia also sent out this picture, in response to Riri, posing with rubber kitchen gloves. Get your cat claws out! 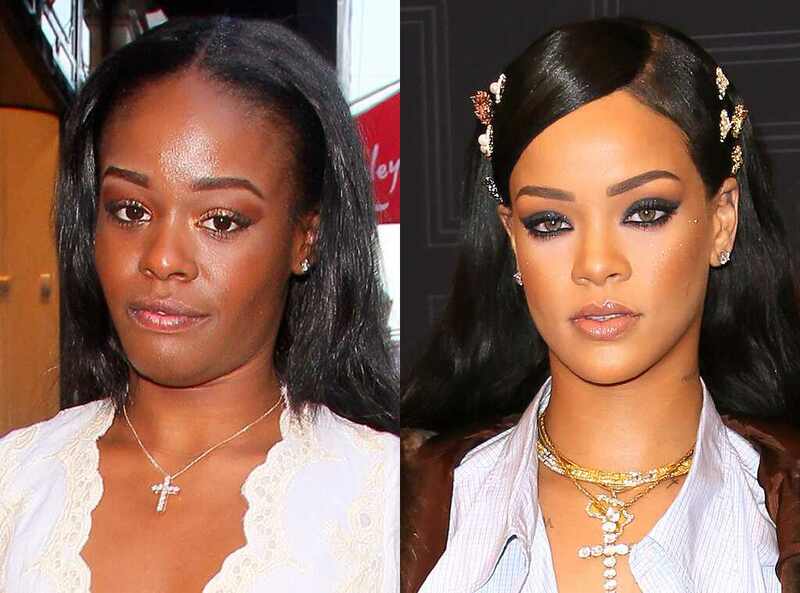 However, this morning the revelations seen here below, show’s that Rihanna has now disclosed Azealia Banks’s phone number, so now you know, that the stakes are getting even higher. Very amusing indeed, but let’s break this down. Rihanna’s sought backup from the known ‘Baphomet’ queen Beyonce, which translates as Beyonce now doing some “black magic” against Azealia Banks. So, is Banks now crafting a voodoo doll of Rihanna and piercing it with needles, in response? We don’t think she is, but we can almost see Beyonce now from our remote viewing booth, wearing horns and sacrificing a goat alongside Rihanna, in opposition to the immigration ban and setting loose a curse on Azealia Banks. Do you see it, too? After all, ‘Beyonce is already working heavy on you’. So, what do we have here? What’s Azealia Banks cooking up for Rihanna, next? Banks already dropped Rihanna’s telephone number on Instagram with the caption, “Bombs Away”. Plus, Azealia went in with some Instagram audio videos at Rihanna, swinging back at her for the “Chicken” comments, but unfortunately, these have already been removed from her Instagram account. We have to say that Azealia Banks wins this battle by constructing somewhat of an argument in protecting the president, whilst, Riri exemplifies no argument and goes with the liberal stance of trying to deflect and get out of any discussion by the use of Twitter photos and labelling Azealia as a “Chicken”. Liberals love labels. Satanists also do love their labels. We kind of love Azealia Banks and we are wondering who has the stronger “black magic” game? Or is it called “witchcraft”? Obviously, it’s Azealia who has the power with her “Chicken Cupboard” and since Rihanna needed to call up ‘Beyonce’ for extra “sorcery” backup, it’s really evident who won this battle. Now, let’s see what becomes of this magic moment. We still say support your President and do not support Satan.